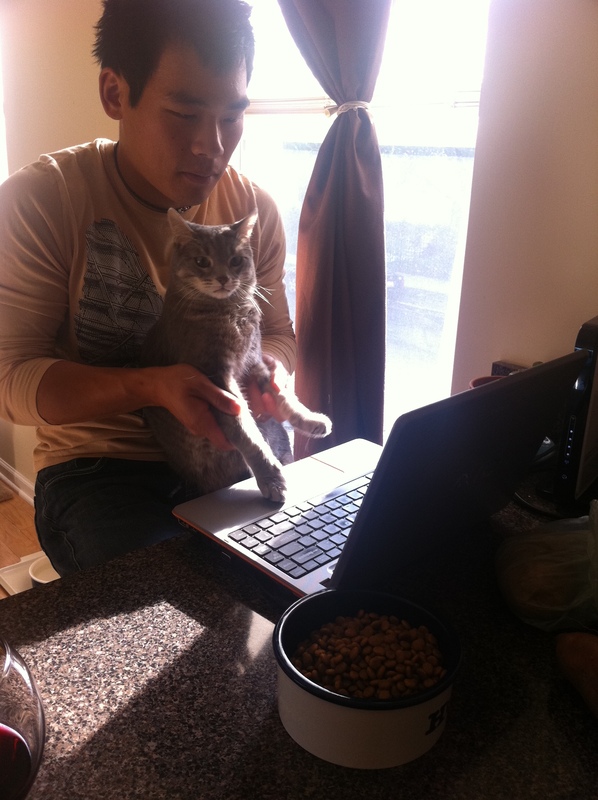 If you keep up with this blog, then you know I’m pretty nuts about my CH cats. I can’t help but love blogging about them; CG is my best buddy and Ellie is my precious darling. But today I celebrate not them, but the man behind the scenes who keeps us all going, my husband Matt. One year ago today we exchanged vows, and from that moment on my life has continued to become more and more amazing. Yes, we’ve gone through some rough patches, but we’ve also been incredibly blessed. And I’m so honored to be able to share all of that with him. Lucky for me Matt turned out to be a cat person. Seven months after we started dating, I adopted CG, and to be honest, Matt’s been a better cat parent than I. From the get-go, Matt had just as much of a heart for cerebellar hypoplasia cats as I did, and he very much valued the importance of letting CG do and figure out things on his own. He was insistent that CG should have those opportunities — to learn how to climb onto the couch, to find a safe way to jump off the bed — and because of Matt CG learned how to do both of those things and more beautifully. He was brave for the both of us when CG needed to learn how to do stairs. He’s the practical one whenever Ellie finds a new way to injure herself. He’s been there every step of the way — during every hard time and success with these cats. And it’s been a privilege and joy to share those moments with him. And it doesn’t stop there. While most people may think that blogging about cats is crazy, leave it to me to blog about special needs cats. But Matt’s always so encouraging, so supportive — to the point where he suggests blog post ideas even though I tend to flippantly shoot them down. He knows and respects how important this blog (not to mention CH cats and the community are to me), and I couldn’t be more grateful. Granted our lives and experiences expand past the realm of CH cats, but it’s everything I’ve mentioned above and more that reminds me each and every day that I truly found my match.